After visiting the famous Katz Deli in NYC and devouring one of their pricy pickles, Chef Shane also known as the “ Southeast’s Julia Child with Tattoos” came home to nail down a even better recipe. 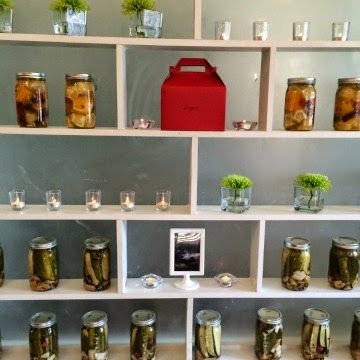 Below please find a pickle recipe you will relish from Ocean Catering's Chef Shane. Bring water, vinegar's, salt and sugar to a boil to dissolve. Let cool. Wash Mason jars in dish washer (or by hand) and let dry. Layer spices and garnish in mason jars. Strain water from cucumbers and place in bucket. Pour hot liquid over cucumbers leaving an 1/4 inch of space at top of jar. Cover with lid and tighten band. Line large stock pot with mason jars. Fill with water until over the top of jars and bring to a boil. Let boil for 8-10 minutes and turn off heat. The jars should come down to room temperature naturally. Remove jars from water and let cool. Wait for 2-3 weeks and enjoy. Pickles can be stored unrefrigerated on pantry shelf until opened. I keep in saying I want to try pickling, so perhaps this is the recipe thatI shall try first. I love the pound of dill I. It and would probably add fewer chilis.